Cake is the heart of a birthday party, without which any celebration is incomplete. Therefore, chennai online florist offers the scrumptious Chocolate Cake With Red Flowers that has a yummy chocolate sponge with chocolate mousse filling. 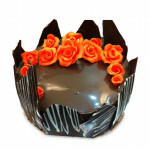 With chocolate garnishes and red roses decoration, this cake would be the star of your party. It is available in Chocolate Mousse, Chocolate Truffle, Irish cream flavors.